As busy as the past year was, I made sure to make time for my spice and my bread group meetups. That guaranteed that I did at least some cooking and socializing during that time and kept me from going completely insane. In addition to meeting great people, both meetups challenge me to stretch outside of my comfort zone and work with ingredients and techniques that are new to me. Sometimes my efforts are not so successful, and sometimes they shine. Like this take on Shepherd's Pie. The spice for our monthly potluck was curry leaves. 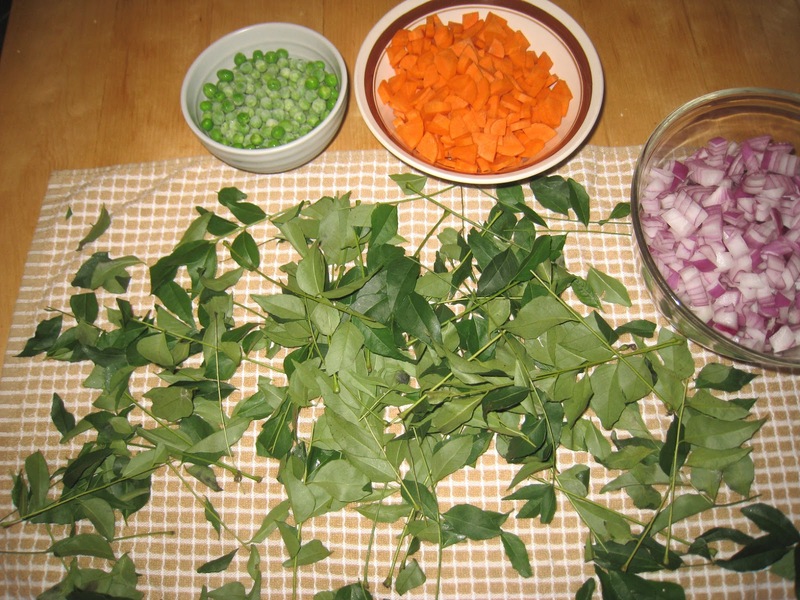 I had heard of curry leaves but had never seen them and had definitely never cooked with them so I was intrigued but had no idea what I was going to do with them. The curry tree is native to India and can be found both in the wild and cultivated. The leaves are rich in essential oils and have a strong earthy, slightly citrus flavor that enhances any dish. In addition, as I discovered when I brought them home and opened up the package, they have a pungent aroma that is unlike anything I have encountered before in my cooking history. They filled my senses the way that menthol does, but without the menthol flavor. The one thing almost everyone who grew up with them commented about on the sites I visited while looking them up online is that because the leaves can be hard to find outside of India they are often omitted, and while good, the dish is definitely not the same without them. And after having used them, I can see why they say that. 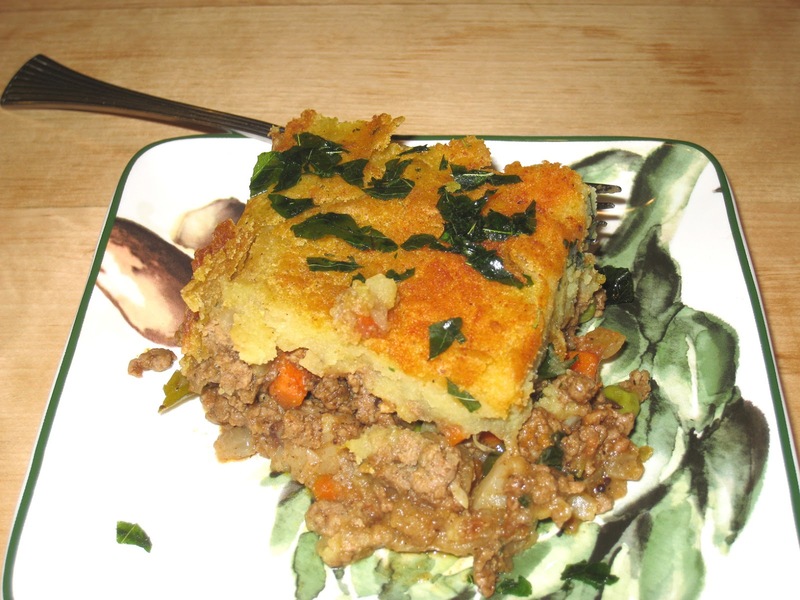 I wasn't sure what I was going to make for the potluck, but I had two pounds of ground lamb and a package of peas in the freezer and potatoes in the pantry, so I started thinking about Shepherds Pie, which usually consists of leftover lamb cooked with peas, carrots and onions topped with mashed potatoes and baked until the potatoes are golden brown. It seemed to me that those ingredients would lend themselves well to an Indian interpretation and I always have carrots and onions on hand so I decided to give it a try. I also had a bag of cauliflower florets in the freezer, which is another vegetable often found in Indian cuisine so I decided to use that instead of celery. But I think celery, which is more traditional to the original version, would be fine to use here instead. The result was more successful than I anticipated. Once the ginger and other spices were added as I was cooking the lamb and vegetables I knew I was on the right track. And adding the Madras curry spices and coconut milk to the potatoes was a stroke of genius if I do say so myself. It would have been delicious with those ingredients alone. But the curry leaves added a deep citrus-like overtone that enveloped all of the separate ingredients and elevated them into one amazing flavor, while still allowing the individual ingredients their place at the table. I will not lie, this dish does not come together in a few minutes. But if you want something that will impress a crowd and have the time, it is worth every minute it takes to put it all together. *Garlic ginger paste: chop equal amounts of garlic and ginger and place in a small processor. Add about 2 tablespoons of grapeseed or canola oil for every 1/2 cup of garlic and ginge and process until a lumpy paste is formed. Will keep in the jar in the refrigerator for a couple of months. Place the chopped potatoes in a saucepan and cover with cold salted water. Bring to a boil, then lower to a simmer. Cook until the potatoes are tender, about 15 minutes. While the potatoes are cooking, heat the coconut milk in a small saucepan, setting the burner as low as it will go. In a large skillet heat the 3 tablespoons oil over medium-high heat. Add 24 of the curry leaves and let cook for a few seconds, then add the mustard and cumin seeds. Let the mustard seeds pop (cover if you want to avoid the splatter), then add the garlic-ginger paste, onions and carrots. Cook until the vegetables are translucent. Add the lamb and cook until it is browned. Add the remaining Madras curry powder, cinnamon, coriander, and garam masala. Cook for another two minutes, stirring constantly, until the spices bloom. Add the tomato powder/paste and the remaining coconut milk. Cook until the mixture comes back up to heat. Add the cauliflower and the peas and cook until everything is heated through and the flavors are well blended. Remove from the heat. Layer the meat mixture on the bottom of a 9" x 13" pan. Spread the mashed potatoes over the top and sprinkle with smoked hot paprika. Bake for 30 minutes uncovered, then check the topping. It if looks like it is drying out, spread a thin layer of grapeseed oil over the top to keep it from getting hard. Return to the oven and bake for another 30 minutes. During the second half of baking, heat a thin layer of oil in a medium skillet over medium high heat. 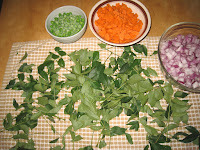 Add the remaining curry leaves and cook until they turn a bright green then remove and place on paper towels to cool and drain, then crush them loosely. When the top of the dish is browned, remove from the oven and sprinkle with the crushed curry leaves.